the current-to-voltage converter, the voltage-to-current converter and constant-current source & the peak detector. Due to stable voltage supply and virtual ground in inverting terminal a constant current is generated. Input resistance of op-amp is extremely high (ideally infinite), so negligible current passes through the opamp. Thus almost all constant current pass through the feedback path. As shown in the figure resistance in feedback in the path is variable. Even if the voltage in feedback is changed, current through the path remains constant. Because of the virtual ground and stable voltage supply. Basic circuit of Voltage to Current Converter using op-amp is shown above. 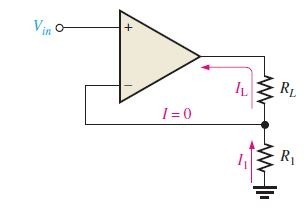 By basic characteristics of op-amp, potential at both the terminals are same. so inverting terminal have the same input voltage \(V_in\) (neglecting offset voltage). Thus voltage across \(R_1\) is equal to \(V_in\), so current \(I_i\) corresponding to \(V_in\) is generated and it never flows to the inverting terminal (extremely high input resistance of op-amp). Therefore entire current \(I_i\) flows throw the load resistor. 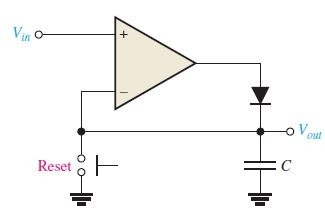 A basic Peak Detector using op-amp is shown in the above figure. When an input voltage is applied to the non inverting terminal. 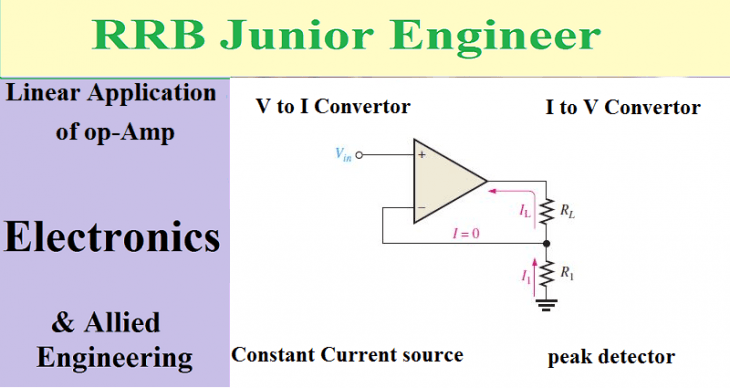 an output is generated and which make the diode in forward bias. The current flowing out of diode is charged into the capacitor. capacitor charged up to a value equal to maximum value of input voltage and thus both input of op-amp have same input. At this point, the opamp switches, and its output goes to the low level. As a result diode become reverse biased and capacitor stops charging. This final charge of capacitor is the peak value of input signal. It will eventually leaked to zero or it can be reset to zero suddenly by closing the reset button.